Every once in a while I stumble across a dish that delivers restaurant-style presentation with relatively easy prep; robust flavors with healthful ingredients; and a pricey air despite not even coming close to breaking the bank. This Classic Moroccan Chicken and Vegetable Couscous is totally that kind of recipe. It is—as Jimmy Kimmel so carefully recounts after each Bachelor episode—amamaaazzzzzzzing. I would also like to take this opportunity to profess my love for Moroccan food. What an understated cuisine! Teaming with lush spices, hearty meats, plentiful vegetables, and generous use of dried fruit; Moroccan food embodies everything I love when it comes to cooking. Although salads, mezze, grills, and bastillas are all commonplace Moroccan dishes, this particular one is modeled after tagine— a signature slow-cooked stew named after the clay pot it is traditionally cooked in. Tagines traditionally simmer for hours, but this one only needs about 30 minutes to boast the same hearty, plentiful flavors. Hearty stews are particular nice for the long winter months, when sometimes it seems like a warm bowl of broth and anything else is the only thing to help endure one more cold yucky day. I know the ingredient list is long, but I promise its a lot of quick, imprecise chopping and can-dumping. The prep is really super easy! The wafting smells from the kitchen will draw you in immediately, a serendipitous mix of savory and sweet. The former stems from your root vegetables, fragrant garlic and onion, cumin, cayenne, turmeric, and chicken, while the latter is derived from sweet cinnamon, golden raisins, and dried plums. Even though the taste alone is enough to"wow", just wait for the presentation: ladled gently in a circle around a mound of fresh couscous with a dollop of Harissa—spicy Moroccan red chili pepper paste—as the final touch. Did I really make this? I thought to myself incredulously, staring at my brimming, colorful bowl but waiting to snap out of a dream and find myself actually sitting at Cafe Mogador. But it was me!—a second (or third) helping confirmed—and it tasted even better the next day. 1. Heat the oil in a very large nonstick skillet. Season the chicken with 3/4 teaspoon salt and cayenne and cook over medium heat until lightly browned on all sides, about 5 minutes. Remove to a plate, leaving drippings in the pan. 2. Add the onion and cook, stirring frequently, until it begins to soften, about 4 minutes. Add the garlic, cumin, curry powder, and turmeric and cook, stirring for 1 minute. Add broth, cinnamon sticks, carrots and turnips or parsnips. Bring to a boil, reduce heat to low, and cook, covered, for 10 minutes. 3. Add chickpeas, diced tomatoes (drained), zucchini, prunes, and raisins. Return the chicken to the stew and simmer uncovered over medium heat until the vegetables are tender and chicken is no longer pink in center, about 20 minutes. Taste for seasoning; add more salt if necessary. 4. For the couscous, bring 4 1/2 cups of water to a boil in a large saucepan. Add 1 1/2 teaspoons of salt and stir in the uncooked couscous. 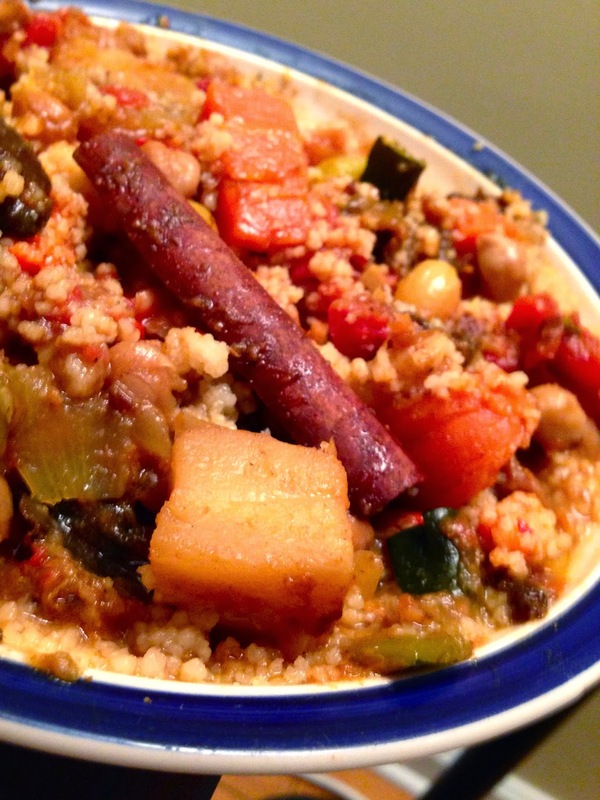 Remove from the heat, cover, and let stand until the couscous is tender and the liquid is absorbed, 5 to 6 minutes. 5. Mound the cooked couscous in the center of wide, shallow soup bowls. Spoon the chicken and vegetables around the outside of the couscous and ladle the broth over them. Serve with a dollop of Harissa in the center.